Josh is still high in the romance between Ranveer Singh and Deepika Padukone, three months after marriage. The couple tied the knot in an exclusive wedding in the beautiful Lake Como in Italy. After which, they had just too many wedding receptions in India for their friends and colleagues. In case you missed watching them do the saat pheres that tied them as husband and wife, do make sure you do not miss out the telecast of Zee Cine Awards 2019. Zee Cine Awards 2019 Full Winners List: Ranbir Kapoor, Deepika Padukone, Vicky Kaushal, Janhvi Kapoor Take Away the Trophies Home. For the hosts of the evening, Vicky Kaushal and Kartik Aaryan, made Ranveer and Deepika take the pheres once again for the audience and their fans. Of course, it was quite a comical moment with Vicky being the pundit. On a more romantic note, the couple displayed their newly married love at every opportune moment they can. 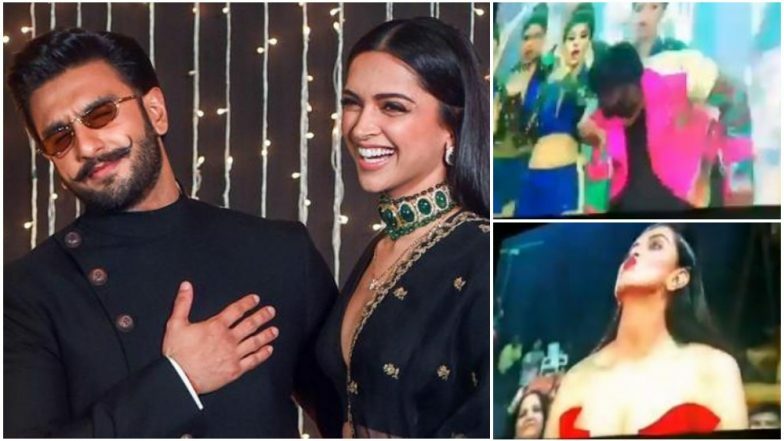 Ranveer Singh and Deepika Padukone Do the Saat Pheras Once Again This Time at Zee Cine Awards 2019 – Watch Video. Like for instance, when Ranveer Singh was performing on stage for a dance piece, he took the time to send a flying kiss towards his wife. What's more Deepika Padukone returned the kiss! It is love in the night, as we get to see more PDA from Ranbir Kapoor and Alia Bhatt. Ranbir was clicked seeing bringing Alia in holding her hand. Ranbir and Ranveer were also seen bonding with each other, the same with Alia and Deepika too.